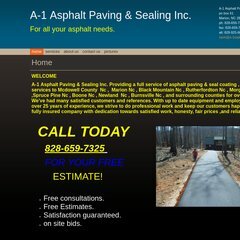 www.A-1asphaltpaving.biz - A-1 Asphalt Paving & Sealing Inc. It has 4 nameservers, including yns2.yahoo.com, ns8.san.yahoo.com, and ns9.san.yahoo.com. Its IP Number is 68.180.151.96. It is hosted by Yahoo Inc (California, Sunnyvale,) using YTS/1 web server.